Today's topic isn't an easy one for me to explore. Not because my Warcraft memories are joyless; it's quite the opposite actually. Across all the logins and raids and experiences I've had in game, a lot of them are quite memorable. As silly as it sounds, I've spent a lot of time over the last few days just trying to figure out what I wanted to put in this space. A lot of more mundane "bests" have cropped up here and there. Memories of finally getting a drop I was farming, like Big Iron Fishing Pole stick out in my mind. I remember when I was farming Crusader on my DK, I never thought it was going to drop. If you go to that Wowhead link, you'll see that it's rarely dropped by only two mob types in EPL/WPL. Finally seeing that green text pop up on my screen after close to four hours of killing lowbie mobs created an explosion of happiness. Finally, my melee twinks could have a proper enchant. I'm a strong believer in providing things (like enchants) for yourself in game. Besides, at that point in Wrath it was pretty difficult to find a person on Kael'Thas with that particular enhancement. Moving down my list of "awesome moments that probably shouldn't be that awesome," next up is when I got my first Arena Grand Master Trinket. I've spent a decent amount of time twinking in this game. I won't get into too much detail, but it's relevant to point out that five of my characters on KT started their lives twinking in some form. My focus was mainly on the level 29/39 brackets. Having an AGM was a definite advantage at this level. It was also, in my opinion, a mark of dedication and awesomeness. The item didn't instantly make you better upon acquiring it, but it sure had its bonuses. For those of you who either haven't heard of the item, or have never attempted to acquire one (which people do these days mostly for the achievement,) take a look at this quest Arena Grandmaster. If you were too lazy to click, basically the road to acquisition requires the player to farm a chest that spawns every three hours in the Gurubashi arena area in Stranglethorn Vale. What makes the quest fun, difficult, and interesting, is that when you set foot on the floor of the arena you're flagged for PVP. Makes sense, considering the quote/unquote "purpose" of the quest reward, right? So, you've got an item in this chest you're after and you might have to kill another player to get it. Consider how difficult this can be on a level 29 toon. Oh, did I mention you have to do it 12 times? I remember setting my alarm to go off in the middle of the night so I could log in at a time when *hopefully* no max level characters were trying to get the chest. Other times I begged guildies to accompany me on their 80's so that if we encountered resistance, I might still have a chance at the chest. When you look at all of these factors, it's easy to see why I was doing backflips when my little 29 rogue got her 12th Arena Master. That was a fantastic memory. Sidenote: all along the way, I vowed to never farm another AGM. The time commitment made losing the chest too frustrating. I eventually got a second trinket, but this one went to Nerdrage (Jacklalane.) Derp. I could go on and on about small (but glorious) victories like these. That's not what you're here for though. 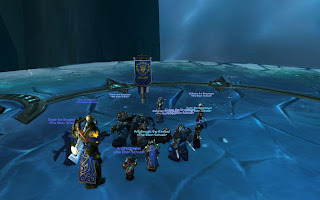 The memory I picked as my "best" in game reflection is when I killed the Lich King on ten man mode on my Shaman. Warning: the most noteworthy part of this memory is the fact that it is 100% despicable and could just as easily be used in a "how Warcraft ruins lives" post. Hey! You weren't looking at the camera! In Wrath of The Lich King I played an elemental/resto shaman named Syntaxx for a guild named The Ebon School. Our main raid group ran the 25 man version of ICC, in which I was mainly a DPS. We were moderately successful, but we hit a frosty Arthas-shaped wall and never managed to climb over it (even with the 30% buff.) 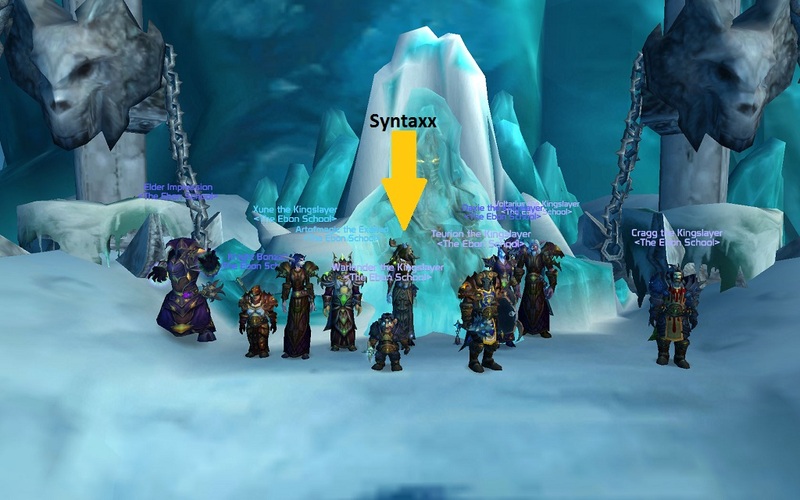 This was back when you could run both 10 and 25 man versions of the same raid in one lockout, so those of us who wanted to keep pushing for the LK kill formed a 10 man group. The players composing this group were a distillation of what was good about our 25 man raid, more or less. Anyway, so the day we killed Arthas sticks out in my mind because of how awesome it was AND how ridiculous I acted near the end. We didn't have to bang our heads against the frozen throne too many times to get the kill, our main problem was raid attendance. When we really got around to doing attempts, our little 10 man always showed promise and progress. It helped that a lot of us were in 25 man gear, I'm sure. Our final attempt was going swimmingly, and we all knew it. We'd conquered the valks and were doing the defile/vile spirits portion of the final phase. My heart was racing at this point. The only other end-tier boss I'd ever killed on any character was Yogg, but that wasn't as awesome because most of us were in gear from TOC. Having "Kingslayer" over Syntaxx's head was in many ways a validation of the effort I put into this game. The boss was probably around 20-30% and two things happened right at the same time. First, I got teleported into Frostmourne. Second, somebody rang the doorbell at my house. I remember getting on vent, floored at the calamity unfolding. I distinctly remember several guildies telling me that the people at the door were going to have to wait. So, with the doorbell ringing several times, I went in and killed the mob inside Frostmourne, got ported back out, and continued DPSing. The doorbell rang again. At this point I'd say Arthas was below 15%. Several of our more heartbreaking wipes were in this range, so I didn't want to stop. I got up and ran to a window to see what horrific act of gaming induced neglect I was committing. MUCH to my dismay, I saw that it was none other than my GRANDMA WAITING OUTSIDE. At this point she'd been out there for probably a solid three or four minutes. At least, it felt that long. When it was clear to me the Lich King was about to one-shot us all at 10%, I went and answered the door. Grandma never really asked what took so long. This was what I saw after I came back from answering the door. The memory is somewhat bittersweet because I didn't actually get to DPS the final 10% of the Lich King encounter, nor did I get to revel in the achievement spam. Making my Grandma wait outside the house while I finished killing a boss is absolutely despicable, but it's also hilarious and a big part of what makes this so memorable. Strangely, she didn't even ask why I took so long to get to the door. She may have thought I was napping/in the bathroom/idk. Glad you enjoyed. And Then There Were Shields: Part One!